Find out who were the big winners at the 70th annual Golden Globe Awards. 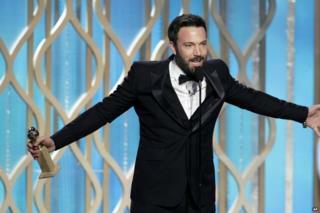 Ben Affleck picked up the best director award for his film Argo. He was nominated alongside Steven Spielberg, Kathryn Bigelow, Quentin Tarantino and Ang Lee. Jennifer Lawrence was presented the best actress in a comedy or musical award. Zosia Mamet, Lena Dunham and Allison Williams celebrate their win for hit show Girls, which took home best TV comedy. Tina Fey and Amy Poehler hosted the awards. The last three years have been presented by Ricky Gervais, who often made jokes at the expense of Hollywood stars. Damian Lewis and Claire Danes both won awards for their roles in Homeland. The programme beat Downton Abbey, Boardwalk Empire and Breaking Bad to the best drama series prize. Adele was awarded a Golden Globe for best original song for Skyfall. She dedicated the award to her boyfriend and her son.